Andie-K and Heshima Kenya share a common goal: the empowerment of women around the world. 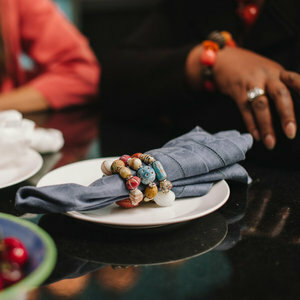 Their unique collaboration will feature exclusive new jewelry designs by Andie-K, made with Fair Trade-certified Kazuri beads from Kenya and inspired by the colors and patterns of Heshima Kenya scarves. Through their partnership, they intend to support women artisans, call attention to the plight of refugee girls and women, and mobilize Chicago leaders who are interested in women’s rights. Together, Andie-K and Heshima Kenya are speaking out for vulnerable women worldwide.